It had been a great year for Adam and Rob with HongKongSnakeID.com. Just this season they had discovered 27 species and recorded them in detail with new pictures and lots of video. But the season and the hunt was not over and they decided to head out to a jungle location where several species of Wolf Snake were known to be found. As a jungle walk it was going to be hit or miss in terms of what they might find, but as luck would have it the Snake Gods were on their side. After a hour or so looking around some hot spots nothing had been found and the group decided to move on to another location, but just as they hit the road Rob spotted black and white bands slithering by a wall and called out to Adam. Adam took one look and said “juvie Many Banded?”, but Rob’s trained eye dialed in and he noted that he wasn’t sure. As soon as Rob said this Adam took a closer look and agreed that it looked much more like a Wolf Snake due to the spacing of the bands and the coloration on the top of the head. But this was a dangerous gamble as a juvenile wolf snake will bite but is completely harmless whereas a Many Banded Krait will bite and can kill you! Just as they had gotten comfortable with their identification the little snake slithered into a storm drain, but Adam and Rob thinking quickly lifted the drain cover and managed to safely extract the snake before it got lost in the pipes. After safely bagging the little snake they moved to an open location to take some quick photos and send out to a wider group of Snake experts to confirm the identification. As luck would have it everyone concurred that it was a Wolf Snake, though there was some initial back and forth on which species it was, everyone eventually agreed it was a Banded Wolf Snake - Lycodon subcinctus (head over to the ‘All Snakes Page’ and look at the four species of Wolf Snake for yourself to see what everyone was on about…). Before the evening was done the group found three more species including a Fustings Wolf Snake making for a great result to the trip. The Banded Wolf Snake was held until the next day for a photo shoot, and it was after this session when Adam was doing some photo editing where he realized just how dangerous the Banded Wolf Snakes mimicry of the Many Banded Krait can be, and how important it is to never assume, even as an expert, that you have identified a snake properly. To illustrate the problem take a look at these comparison photos of a juvenile Many Banded Krait and the juvenile Banded Wolf Snake. Would you be willing to bet you've guessed the right one on a dark night in the jungle?…. The bands on the juvenile Many Banded Krait tend to be a bit closer together and more uniform… But not always. The body of the juvenile Banded Wolf Snake tends to be more cylindrical and the Many Banded Krait more triangular… But not always. The juvenile Many Banded Krait tends not to move into an ‘S’ shape before it bites but the Banded Wolf Snake does… But not always. 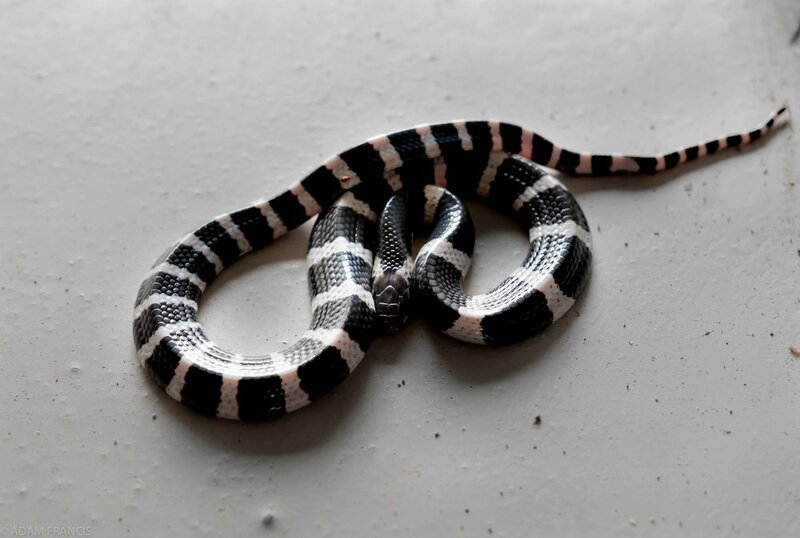 The white markings on the top of the juvenile Banded Wolf Snake tend to be broader and more in contrast than the Many Banded Krait… But not always. Are you catching the theme? Despite there being some indicators there is no completely accurate way to differentiate these two in the field given how much variation there is in color and pattern between and within species. For more great pictures of the Banded Wolf Snake and the Many Banded Krait check out the gallery in their full write ups on the Banded Wolf Snake and Many Banded Krait pages of HongKongSnakeID.com or check us out on YouTube and Instagram.